The kind folks over at A&H sent me a GL2800 to play with for awhile, and Im sure a lot of you guys are itching to hear about the board. The full feature set can be found Here. The first gig was a learning experience. I used it for a school's battle of the bands. It took a little while to get used to. Im used to the meters on each channel being off to the right of the fader, however on this board they are on the left side. Took a little while to get used to. The EQ also took some getting used to. It sounds great, but has a very narrow Q. I found myself using less eq then normal, but at the same time I was using completely different frequencies then normal. Normally I boost 3k on the kick channel, but I found myself boosting 1k with the A&H. But, I must say I really like how the board sounded. It's very clean and transparent. I pushed it hard(up to clipping) and really didnt hear any distortion. The mute groups are also nice. Instead of going through the trouble of hitting the mute button on each channel, I can just hit the mute group and be done with it. 10 auxes is also nice. You can switch the first 8 pre/post in groups of 4, and you get 1 stereo aux(9-10). You can run 4 monitor mixes, 4 efx, aux subs and still have another stereo aux left! Now thats what Im talking about. However, there are a few things I didnt like so much. They did a great job with packing a ton of features into a small space, but thats the problem. Too much stuff too close together. The knobs are a little close together, and someone with fatter fingers might have problems with bumping into other knobs. Also, the routing buttons on the channel strips are a pain. There are a ton of buttons real close together. Ive hit into them a few times and rerouted things... Woops... Oh well. One last thing that I would have liked is LED's to let you know whether the phantom power is on or off. But, I can live without that. Also, another thing Ive noticed with all A&H's is slower meters. Ive never quite got the concept of that. On my Peavey board the meters are very quick, but with any A&H I've mixed on the meters are a lot slower. Whats the reasoning behind that? One of the A&H's new competitors is the Mackie onyx boards. Ive been mixing on the onyx's for some time now and really like their sound. The A&H sounds completely different though. I thought the Mackie would give the A&H a run for it's money, but there is no competition. 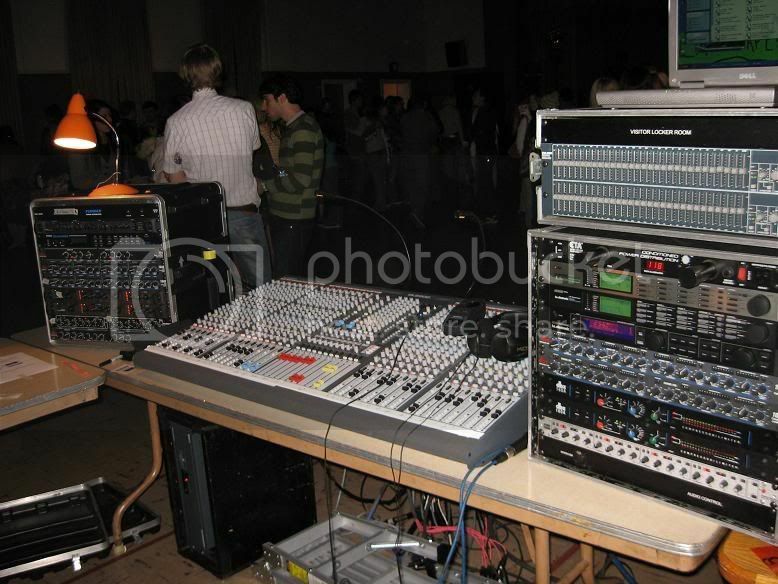 The Mackie has a more middy sound to it, while the A&H has no "sound" to it. I like the EQ on the A&H a lot more and I like the feel of the A&H board. Mackie's sweeps dont go below 100hz, A&H goes to 35hz. You just cant beat that! The Mackie is also a lot larger and heavier then the A&H. The 32 channel gl2800 is just over 4' long, less then 2' deep and only around 100lbs. The Mackie is over a foot longer and deeper too. It also weighs around 10lbs more. I'd pick the A&H board over a Mackie any day, though Mackie has really improved. I also would have liked an internal psu. The external one is a pain to haul around. First gig with it. Tom Mixing. Ill post some more pics after my gig with it this weekend. Which Mackie Onyx are you using? I found myself using less eq then normal, but at the same time I was using completely different frequencies then normal. Normally I boost 3k on the kick channel, but I found myself boosting 1k with the A&H. Dunno what other mixer you're using, but you might want to test both to determine the accuracy of the silkscreen. The mute groups are also nice. Instead of going through the trouble of hitting the mute button on each channel, I can just hit the mute group and be done with it. Yup, mute groups are nice, nicer still that they're in a console at the GL2800's price. However, there are a few things I didnt like so much. They did a great job with packing a ton of features into a small space, but thats the problem. Too much stuff too close together. Differing meter ballistics. You're talking about the main meters? Maybe the A+H uses true VU ballistics whereas the Peavey doesn't? I think the meters respond the way I expect (which is to say, VU). I do wish the main meters were somewhat larger, but since there are input meters on all channels (also excellent considering the price), I find I don't PFL channels much on this desk (except to, you know, LISTEN to them) because the levels are right there. Look at the size of the PSU, and then look at the size and weight of the console. That'll tell you why the power supply is an external box. Also, it keeps the heat generated by the power supply out of the console (a Good Thing). I am always curious when people describe the sound of something like a console that should be neutral. It might be instructive to attempt a null test using a third mixer with either an inverting input or polarity swap cable. I would expect (hope) the mic pre and board with EQ zero'd would null fairly deep. If not what is the remaining difference when listening to full range music as a source after best null? I do expect EQs to have characteristic differences in Q, range, and pot tapers. Havent smaarted the boards, but Ive mixed the 3 boards on the same rig. A&H has a more "flat" tone to it. A bit of background. The venue I work for was in the market for a replacement desk for a rapidly decaying Spirit Live 4:2 board. Having had a mixwiz for smaller shows in the venue and having toured with various GL and ML desks: we bought the GL2800 and GL2800M based on their spec sheet alone in September. Pricewise you'd be very hard pushed to fit the amount of capability in with desks from other companies (and I not aware of a direct competitor to the GL2800M). In use we've had no problems, the flexibility of the 2800 is great for when you can only fit in one desk but still need to handle a fairly busy stage. Another feature which I think it's great they've snuck in is the pink noise generator (also does 1k tone), which is very useful for accurate troubleshooting. A lot of desks around the level of this one seem to stick with a 1k tone alone. Good to have a useful matrix section in there too. TBH I think the density of the controls is fine (and this comes from a guy whos poker playing mates call him "bludgeon fingers"), I get where you're coming from on the routing buttons on the channel strip-but there again where else do you want to put the buttons? EQ-wise it sounds good (for what you pay for it). Obviously the board sells at a competitive price, but I don't feel disappointed by the EQ-you can get where you're going with it. Would I prefer a more expensive console? Yes. Did the venue have the budget for it? No. Does the desk still do the job I ask of it? Yes. As always in life and engineering it's a compromise-the GL2800(and M version) has been a good one for us. Re. silk screen of frequencies on consoles: having measured the inaccuracies of lab equipment which claims more precision than the frequency sweep on an eq I tend to fall very much on using your ears to judge if the eq is acting where you want it to-on some desks you can make the same tonal adjustment on two channels and end up with the sweeps and gains in quite different positions. We'll actually - no it does not. When set flat - both boards sound (and measure) essentially the same. There is something else causing that impression. - I like, and use the A&H boards. I gave up on Mackie after they became the BOSE of "MI/pro" audio. Used the board again last weeked. Another sold out gig. 800 people rocking out to another great night of music. Im really starting to like all the extra auxes. I ran 3 IEM mixes for one of the bands from FOH at my last gig. It was a breeze. Auxes 1-4 were mons, 5-6 efx, 8 subs and 9-10 recording. Pretty sweet. Loaded the board down and it did great. I also like the aux config for auxes 9&10. They're stereo so you can take advantage of a post fader board recording and make it stereo! I was running a mono room mix, but stereo recording. Aux 9 acts as the volume and 10 is the pan. Pretty cool feature. The board is really starting to grow on me. I love the sound and all the features. A&H did a great job with this board!